It is a common question that many Apple users encounter when they want to record music from audio in their browser, system audio or application on Mac. How to record streaming audio Mac? 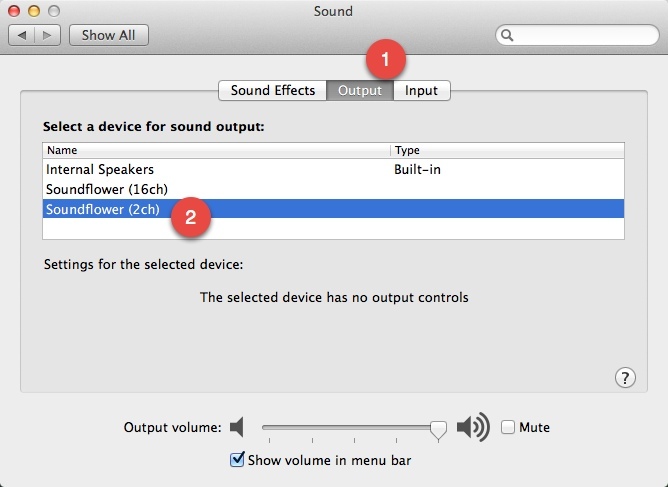 This step-by-step guide will illustrate how to capture streaming audio Mac. 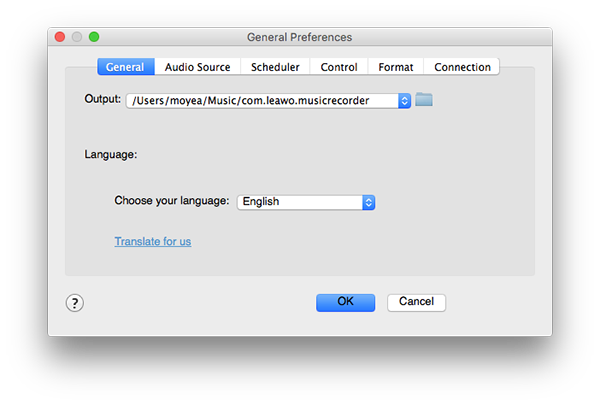 With intuitive and easy-to-use interface, Leawo Music Recorder for Mac offers a comprehensive solution to record streaming audio Mac. The streaming recorder Mac is able to record any audio played on Mac, including local audio, online audio and microphone audio, radio streaming audio, etc. If you are not convenient, the embedded Task Scheduler helps you automatically record streaming audio Mac by setting start time and duration. The Mac streaming audio recorder also has an Auto-filter to remove ads in the recording and music tag editor to allow users to manually add and edit music tags like title, song name, artist, etc. 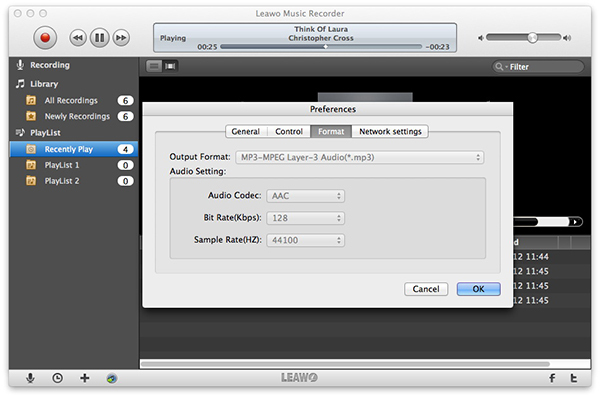 What’s more, Leawo Music Recorder supports to export audio in the output format of WAV, MP3 and M4A. Download and install this Mac MP3 recorder software on your Mac computer and then launch it. It works on Mac OS 10.6 and later. Here’s how this streaming audio recorder Mac captures streaming audio Mac. 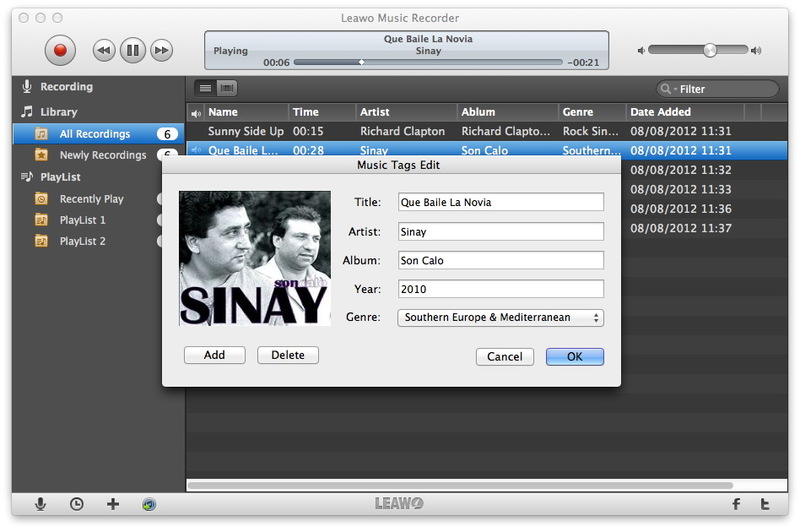 Head to Leawo Music Recorder > Preferences > General to set output directory in the "Output" box. On the same panel, click "Format" to choose the output format of WAV, MP4 and MP3. The parameters like "Bit Rate" and "Sample Rate" can be changed on the panel. Tap on the little microphone icon at bottom left to choose "Record Built-in Audio" or "Record computer Audio" in "Audio Source" panel. We are going to record streaming audio, thus we can choose "Record Computer Audio". Prepare streaming audio you need to record, then click the red button at top left to start to record streaming audio Mac. You can play streaming audio now. When you finish recording, you can click the recording button to stop recording. 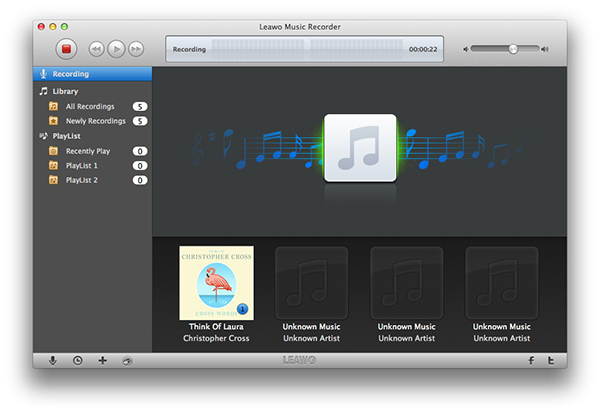 Go to Leawo Music Recorder > Library > All Recordings, then all recordings will show in the right interface. Right click the recording you need to edit to choose "Edit Music Tags" to edit music tags like song title, artist name, genre, etc. For Windows computer, please turn to Leawo Music Recorder to record MP3 audio on Windows computer with ease. As we all know, Mac has no built-in ability to record streaming audio. However, Soundflower can be worked as input or output device that allows Apple users to record streaming audio and different application to send or receive audio at the same time. It supports 2 and 16 channel audio and usually 2-channel one is enough for users. Soundflower is able to record both voices in the interviews. For example, it can record both voices of an interview via Skype. Besides, Soundflower can be used to record streaming audio from applications or websites like iTunes and Spotify. This streaming recorder Mac might be a little tricky when you first use it and sound may have interference at first. 1. 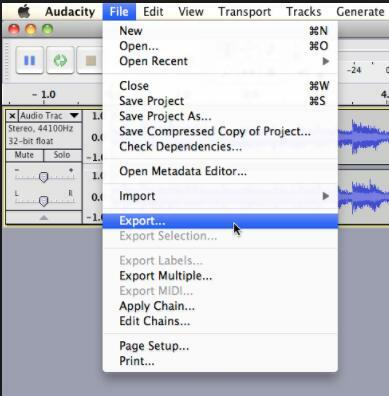 Make sure you have Soundflower and another sound recorder (for example: Audacity) installed on Mac. 2. Click Apple Menu to go to System Preferences > Sound > Output, then select Soundflower(2ch) as the device for sound output. Launch Soundflower on Mac and a flower icon will appear on Mac bar. 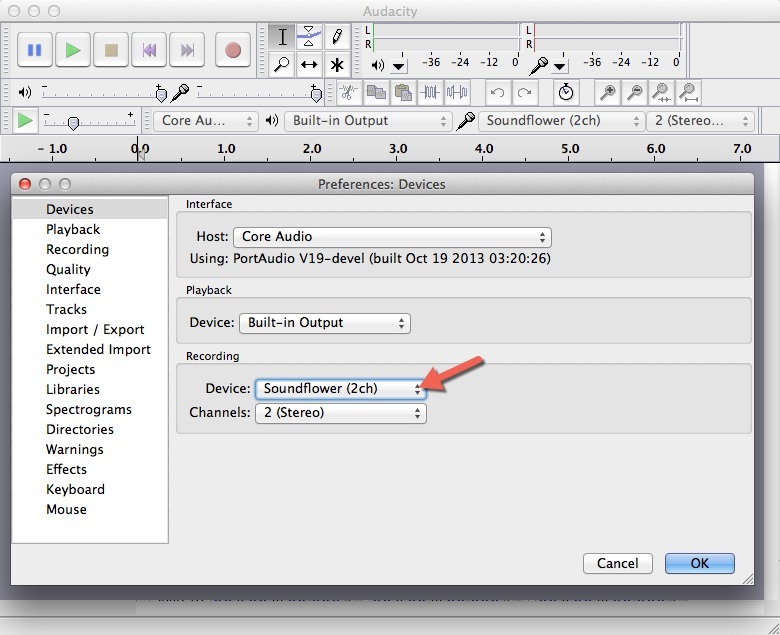 Tap on flower icon and choose "Audio Setup" to ensure that Soundflower(2ch) is the default built-in output. 3. Open another sound recorder. Here we take Audacity as an example. After launching the software, go to Edit > Preferences > Devices and select Soundflower(2ch) as the recording device. Then go to Quality to change sample rate and quality. 4. Back to the main interface and click the red circular button to start recording and you can play streaming audio. When finishing recording, you can click the brown square button at top left to stop recording. 5. Go to File > Export to save audio in the target output directory. The file can be saved in various output formats like MP3, WAV, OGG, AC3, etc. 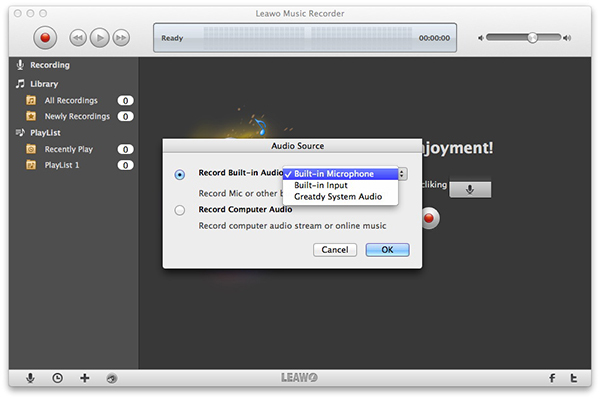 In comparison, Leawo Music Recorder is easier to use, for it can record streaming audio Mac on its own. However, users have to download other recorders to record streaming audio with Soundflower. Leawo Music Recorder is featured by recording any audio from any audio sources and setting bit rate and sample rate to adjust sound quality. It can also automatically download audio tags and allows users to edit music tags. Soundflower is simply an input device and output device. It is used to transfer audio when Mac has no built-in ability to record streaming audio. In terms of itself, it doesn’t possess the ability to independently record audio.